Mobile data consumption in India has grown at a rapid pace of 24 times in last five years, and is set to increase four-fold in the next five years through fiscal 2022, with data subscribers expected to double beyond 900 million and penetration reaching 80% from 40% at present, Crisil said in a report, adding that the faster penetration would be supported by a continued drop in tariffs given the intense fight for the all-crucial market leadership. Airtel seems to have taken the Crisil report seriously. Airtel’s recently launched Rs.1198 plan offers 5GB per day for 4G users on the 4G handset with a validity of 28 days and free calls. Non-4G handset users will get 9GB night data for 28 days. But still, free roaming is a distant dream with Airtel. If Airtel wishes to stay on top, it has to include free roaming too like Reliance Jio. The number of smartphones is rapidly growing, and this is translating into a large number of Mobile internet users. The agency added that India’s mobile data usage per subscriber nearly doubled to around 1.3GB per month between fiscal 2013- 2017 on faster adoption of 3G and 4G services. The per subscriber usage will reach 2.3GB per user by 2022, or closer to the trend in many evolved data markets, and stabilize thereafter. 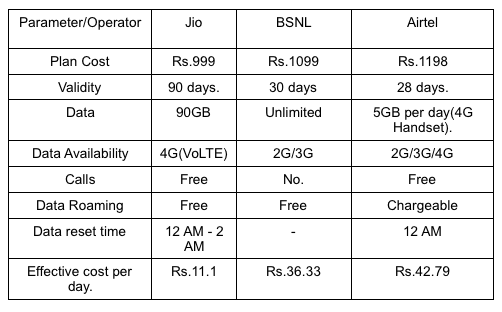 Jio’s Rs.1500 phone whose effective price is Rs.0 will be the last nail in the coffin for incumbent telecom operators if they do not match up with Jio’s plan pricing. Incumbents have few fortnights to come up with new enticing plans for the subscribers before the commercial launch of JioPhone. Airtel is going through a lean phase like every other incumbent because of the predatory pricing by Reliance Jio. We hope to see all the telecom operators work in unison to give a better user experience. Subscribers should be given the opportunity to customize the plans as per one’s usage. For example, a pricey plan with more data and more call may not be a good idea for one whose data usage is less and vice versa. Note: The data offer might differ from user to user. Please check the offer by heading over to My Airtel app or Airtel online recharge portal. Airtel network is not good at all. It fluctuates every now and then. Before connecting call seconds start counting. And it is more expensive network. Services are not good. Not happy with airtel network at all. Repenting after porting to airtel.